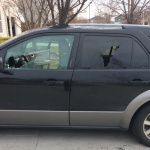 Five different people in a south Boise neighborhood woke up Saturday morning to find their cars had smashed windows. All five cars were parked on the street or driveways in the Lake Hazel Road/Seabreeze Way neighborhood. 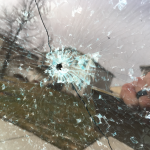 It appears vandals used a BB or pellet gun to shoot out the windows of random cars between 10 p.m. Friday and 9 a.m. Saturday. The cars were parked on S. White Cliff Avenue, West Mossywood Drive, and West Portola Drive within a mile of each other. The cars were not burglarized – just damaged. Anyone with information should send an email to cau@adaweb.net or call Ada County non-emergency dispatch at 377-6790.